Using twigs in flower arranging is a good way to bring additional texture, height and shape to a flower arrangement. Often larger arrangements will use twisted or curly tree twigs to add an architectural quality to support the flowers of the arrangement. The twigs become a structure to show off the colors. In smaller arrangements, twigs can be gathered for impact and their similarity can be used to bring a rustic texture to the arrangement. Adding twigs to flower stem arrangements is interesting and fun. Select a vase with an upright cylindrical shape. Choose twigs that are fairly straight but have an unusual coloration or bark. Place the twigs around the outside of the vase so that the bottom of the twig is even with the bottom of the vase. Use two large rubber bands to hold the twigs in place while you work. Adjust the twigs until the vase is completely covered. Wrap raffia around the vase over the twigs approximately 2 inches from the top and 2 inches from the bottom. Tie the raffia into a firm knot and trim each end to 1/2-inch using scissors. Remove your rubber bands. Do not trim your twig tops until you decide if you want an even or random effect. Cut your twig tops level with the top of the vase if you want a more formal look. Make irregular cuts for a more casual vase. Use garden nippers to cut your twigs. Insert a frog into the vase. A frog is a device to hold flower stems upright and apart. Select longer stem flowers such as tulips, daffodils or irises. Place the flowers that are likely to bend around the outer ring of the frog and the more upright flowers closer to the middle. Cut each stem on a sharp angle using a floral knife to allow the flower stem to continue to intake water. Remove any leaves and insert your stems into your frog. Add filler flowers to enhance the shape of your arrangement. Add water and change water frequently. 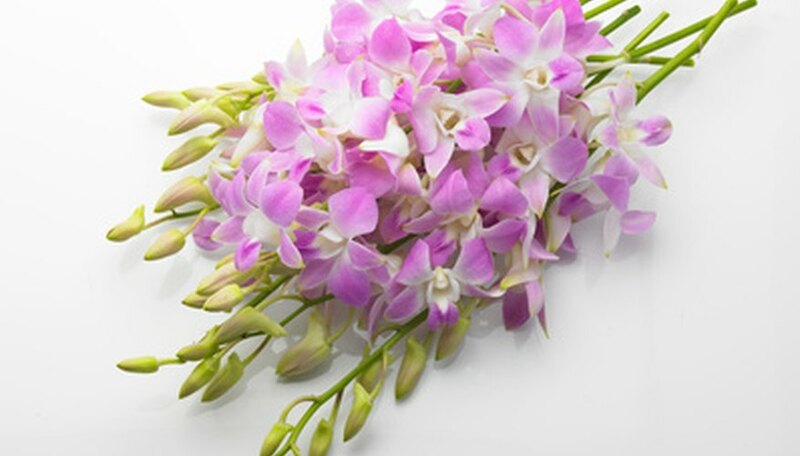 Larger twigs go particularly well with orchids or other unusual flowers.